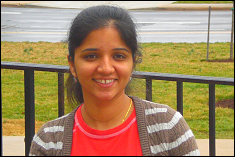 Congratulations to Monica Syal, aerospace engineering doctoral student. She has been awarded the Zonta International Amelia Earhart Fellowship for the 2009�?2010 academic year. This fellowship is granted annually to women who demonstrate a superior academic record in the field of aerospace-related sciences, and aerospace-related engineering. The fellowship award is $10,000, which may be used to cover tuition, books, and living expenses. Monica completed her Bachelors in Aeronautical Engineering from the Punjab Engineering College, Chandigarh (India) in the year 2004. She worked in the Defense Research and Development Organization in India until August 2006, when she joined the University of Maryland as a Masters student with advisor Dr. J. Gordon Leishman. After finishing her M.S. in Dec. 2008, she is currently a PhD student with Dr. J. Gordon Leishman, and is working on the Helicopter Brownout problem. For information on how to apply for the Zonta International Amelia Earhart Fellowship, please visit their website.